Tom Cotney was named to his post as CEO of Imagine Communications in December and has already proved a quick study in the ins and outs of the NAB Show and the broadcast business, leveraging three decades of experience in the telecommunications and mobile-technology industries. He also grasps the challenges that Imagine specifically faces as well as those that everyone will face during a multifaceted transition to IP, the cloud, and more. One step that has already been taken is that Imagine has split its business into two organizations: one for playout and networking (led by Steve Reynolds) and one for advertising (led by Sara Foss). 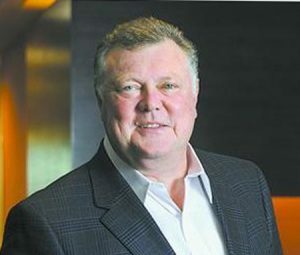 Cotney will serve as CEO of both. On the playout and networking side, Imagine, like many vendors in the traditional broadcast space, finds itself learning from customers who are doing things in new ways. IT departments, increasingly, are managing the broadcast tools that will ride on a traditional corporate network. But a product like Imagine’s Versio playout system (and nearly all broadcast-equipment manufacturers’ IT-based systems on IT networks) usually require a playout or master-control workflow that does not respond well to the congestion on data networks built for traditional enterprise applications. Cotney’s experience includes serving as GM of IBM Global Services’ communications sector, so he is well-versed in the IT world. The trick to overcoming resistance, he adds, was to engage with those in the marketing department who quickly saw the value of embracing IT workflows, which could speed up transactions and business processes. Business needs would overrule concerns of an IT department, whose job, ultimately, was about not allowing a system to become less reliable. One example of that is the aggressive effort Imagine has made to embrace next-generation workflows. The company has been successful in getting customers to sign on for the journey. Cotney says the challenge now is to satisfy early adopters by the end of this summer and then take the next steps with a better understanding of how to get customers fully operational and comfortable with new workflows. “Some of the learnings will help us be better in the cloud,” he adds. At NAB 2018, one of Imagine’s big introductions was the xG Scorecard, an analytics and business-intelligence tool designed specifically for the media industry. It provides a comprehensive, holistic, and highly visualized view of performance and audience data, enabling smarter advertising-sales and programming decisions. The multisource capabilities of xG Scorecard make it possible to blend data from traditional sales and traffic systems, operational databases, ratings, clickstream, and even social networks to build a holistic view of audiences with real-time insights. By bringing together data normally stored in silos, xG Scorecard offers a powerful and highly visual way of evaluating and fine-tuning a media business.